Immigrant Belly, Meek Mill & M.I.A. Bang Rye Rye & M.I.A. Legalize My Medicine (feat. M.I.A.) Nump & M.I.A. Rock Off Shake Off Rye Rye & M.I.A. Rain Dance The Very Best feat. M.I.A., The Very Best & M.I.A. Better Than You Rye Rye & M.I.A. One For The Head Skit M.I.A. Dash The Curry Skit M.I.A. Mango Pickle Down River (With The Wilcannia Mob) M.I.A. Bird Song Blaqstarr Remix M.I.A. Boyz Feat. Jay Z M.I.A. Paper Planes Slugga Black & M.I.A. The New International Sound Pt. 2 (feat. M.I.A.) GENER8ION & M.I.A. Sunshine Rye Rye & M.I.A. Give Me All Your Luvin' Nicky Romero Remix Madonna, Nicki Minaj & M.I.A. Give Me All Your Luvin Laidback Luke Remix Madonna, Nicki Minaj & M.I.A. Paper Planes Afrikan Boy & Rye Rye Remix M.I.A. Bad Man (feat. Vybez Cartel & M.I.A.) Missy Elliott, Vybez Cartel & M.I.A. Internet Connection Flux Pavilion Remix M.I.A. Come Around Album Version Edited Timbaland & M.I.A. Paper Planes DFA Remix M.I.A. Bird Song Diplo Remix M.I.A. B-Day Song Madonna & M.I.A. Give Me All Your Luvin' Madonna, Nicki Minaj & M.I.A. 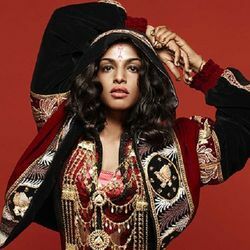 Discover more playlists and music by M.I.A. on PLAYLISTED. Like Immigrant, Kites, Bang and Die Aussicht.